We’ve looked into the costs and necessary hours for English speakers to start learning a new language from scratch and go all the way through to fluency. 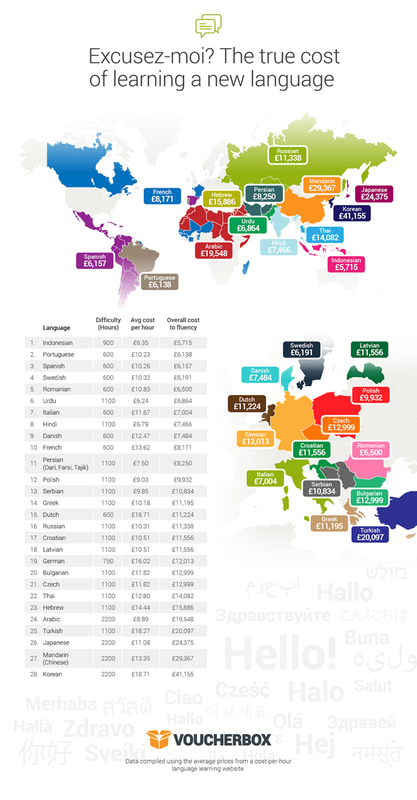 The data was compiled using the average prices from a cost-per-hour language learning website, and calculating the estimated expenses of learning 28 languages from around the world. As well as the cost per hour, the research also looked into the difficulty of learning each language, with average hours needed ranging from 600 hours to a staggering 2,200 hours. The 28 languages were picked from around the world and included European languages such as Spanish, Italian and French, as well as the more exotic languages such as Persian, Mandarin and Thai. Many European languages were ranked as the most expensive langages to learn based on cost per hour, with Dutch costing an average of £18.71, German £16.02, French £13.62, Italian £11.67 and Spanish £10.26. Some of the cheapest languages to learn were more than half as cheap, for example Urdu cost an average of £6.24 per hour, Hindi £6.79 and Arabic £8.89. Other expensive languages to learn included Turkish at £18.27 per hour Hebrew £14.44, Mandarin GBP 13.35 and Japanese £11.08. The high costs of learning European languages, however, are offset by the fact that several European languages are also the easiest to learn, based on the calculated hours required time to master that language. The easiest languages to learn included Danish, Dutch, French, Italian, Portuguese, Spanish, Swedish and Romanian, with an estimated 600 hours of study required to become fluent, with German close behind requiring only 750 hours to learn. This contrasts vastly with more difficult languages such as Arabic, Madarin, Japanese and Korean which take an average of 2,200 hours to learn, pushing up overall costs. Combining both hourly costs and hours required, it was discovered that Indonesian was the overall cheapest language for English speakers to learn, costing around GBP 5,175 in total or GBP 6.35 per hour for around 900 hours of study. At the other end of the scale, Korean was the most expensive language to study for English speakers with a staggering price of GBP 41,155 or £18.71 per hour for 2,200 hours of study. The results showed that although Indonesian took longer to learn than easier languages – with around 900 hours needed from start to finish – it had a cheaper average hourly rate of tuition of GPB 6.35, meaning the overall cost was the lowest. Coming in at second place as the overall cheapest language was Portuguese, with a total cost of GBP 6,138. The differences to Indonesian were that although the hourly price was a costly GBP 10.23, only 600 hours were needed to speak fluently. This was followed by Spanish, which ranked as the third cheapest language to learn with a total cost of GBP 6,157. This included 600 hours of language priced at GBP 10.26 per hour. In terms of typical school-taught languages within the UK, it’s those who study German compared to French that should be pleasantly surprised. Within the research, it was revealed that students on German courses at school could save GBP 12,013 compared to just GBP 8,171 if they had chosen to learn French. Tipping the costly end of the scale as the most expensive languages to study included Korean, Mandarin and Japanese. To learn Korean, you must set aside a whopping GBP 41,155, as well as dedicating 2,200 hours to the language. It was revealed that besides being one of the most difficult languages to learn, it also costs around GBP 18.71 per hour, the most expensive hourly rate in this study. Mandarin, also referred to as Chinese, will set you back a total of GBP 29,367, while Japanese is also expensive, priced at an average total of GBP 24,375 to learn. Shane Forster, UK country manager for Voucherbox.co.uk, said, “The information we uncovered was quite startling. Although we understand that few people would end up learning a full language at an hourly rate, our calculations can be used as a way of working out the cost expectancy for studying various languages. “Even with a tuition bundle discount, such as a crash course, Korean is still highly likely to cost much more than Portuguese or Spanish due to the higher rates of tuition and the recommended time taken to learn the language. “Our calculations also don’t take into account the cost of learning materials such as textbooks which would also be necessary in learning a language, with harder languages likely requiring more resources than easier ones, which would additionally raise the cost.